Free money is good. But if someone wants to give you even more money, maybe you should give that some thought? NORTHROP GRUMMAN builds the GROUNDBREAKING X-47B remotely piloted carrier aircraft. Image SOURCE: NORTHROP GRUMMAN. Here's a puzzler for you: I'm pretty well-known for being a fan of Northrop Grumman (NYSE:NOC). I think Northrop's making the right move in emphasizing the development of unmanned, drone aircraft, because I think that's where the future of U.S. military aviation lies. At the same time, I like Northrop's victory in the contest to build the nation's new Long Range Strike Bomber, and I like Northrop's chances of winning the T-X trainer aircraft contract from the Air Force as well. But as much as I like Northrop Grumman as a company, and as much as I respect that company's products, I was recently asked if I like Northrop Grumman as a stock, and in particular, as a stock that pays a good dividend. Don't get me wrong. Northrop Grumman pays a respectable dividend today -- and has in fact tripled the size of its payout over the past decade. But as Northrop Grumman's stock price has skyrocketed over the past couple of years, the yield on its dividend (the dollar value of the divvy divided by the stock price) has plummeted. NOC Dividend data by YCharts. Result: The $3.20 per share that Northrop Grumman is expected to pay in dividends per share over the next year now yields just 1.7% on the price of the stock. That may not sound too bad out of context, so let's put it in context. I recently ran Northrop's dividend yield through a free stock screener on finviz.com, comparing its payout to those of a half-dozen of its closest competitors in the defense industry. Northrop Grumman's yield placed second to last on the list. General Dynamics (NYSE:GD) -- 2.1%. Northrop Grumman -- the aforementioned 1.7%. And at the back of the pack, Textron pays 0.2%. Technically, I suppose I could stop right here and say: "Voila. Here are not just two, but five different defense contractors that all pay better dividends than Northrop Grumman." Instead, I want to tell you why I like two of these companies in particular, and think they're better dividend plays than Northrop. Only one rung north of Northrop on this list when it comes to dividends, General Dynamics might not seem that much better than its rival. But while the fraction-of-a-percentage-point-better dividend that General Dynamics pays may not seem like much, it works out to 20% fatter dividend checks coming your way every year. What really attracts me to General Dynamics, though (in preference to Northrop), is the fact that General Dynamics' stock is also cheaper than Northrop's. At just 14.9 times earnings, General D's P/E ratio offers a nice discount to the 18.3 P/E found at Northrop. And with S&P Global Market Intelligence projecting that General Dynamics will grow its earnings at better than 10% annually over the next five years, versus only a 7% growth rate at Northrop Grumman, General Dynamics isn't just cheaper today, it's expected to be cheaper tomorrow as well. Similar arguments have me thinking that Boeing stock is a better buy than Northrop Grumman -- even if Northrop succeeds in holding off Boeing's legal challenge to its winning the LRS-B contract. Dogged by worries of slowing commercial plane sales and an SEC investigation into its accounting for airplane development costs, Boeing stock has taken a dive this year, and currently costs only 15.6 times earnings. The stock's pegged for 9% earnings growth by S&P Global Market Intelligence, slower than General Dynamics but faster than Northrop. Best of all for dividend investors, Boeing's 3.9% dividend yield tops the list of all stocks mentioned above. Quite literally, Boeing pays you better than any other company in this industry. Long story short: There's absolutely nothing wrong with owning Northrop Grumman stock. 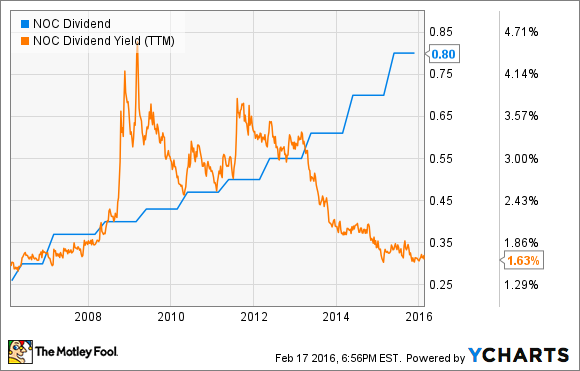 There's nothing wrong, or even ungenerous, about its 1.7% dividend yield. All that said, there's a wide, wide world of stocks out there, and there's no reason not to explore it. You can certainly find a better dividend than the one Northrop Grumman pays -- and you should.